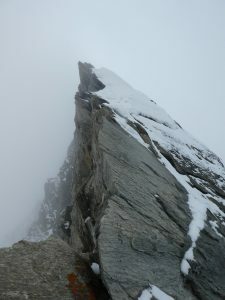 The Täsch-Dom traverse is a classic moderate Alpine route. 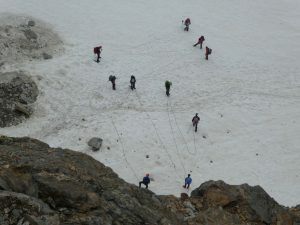 The normal version starts with a hike up to the high Mischabeljoch hut the day before, then climbs the Täschhorn’s south ridge, continues to the Dom, then descends the standard northwest glacier route. For various reasons, I did something slightly different: I started from the car-park in Randa, climbed to the Kin Hut, then ascended the Kin Glacier and northwest face of the Täschhorn to join the normal route. This was a fairly brutal day, with around 3300m gain and terrain requiring big boots. 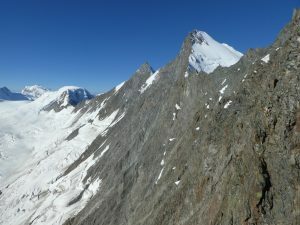 However, it is a good route for day-hiking, since the key snow climb is west-facing, and if you are forced to bail at or before the Täschhorn, you will have just climbed a route that would be hard to find on the descent. I emerged from the car park at 3:30 and headed up through the village of Randa, following the signs and the map on my phone through a few roads and a maze of trails leading to various places in the hills. My guidebook described a route leading from the Dom Hut to the Täschhorn’s northwest face, but it sounded complicated and dubious (“descend slabs to the glacier” is never good to see), so I headed for the Kin Hut, below the toe of the Kin Glacier. The light was on when I got there just before dawn, but I saw no climbers or guardian at the little-used hut on the way to nowhere. I continued on a rapidly-fading trail toward the foot of the glacier, eventually turning left up the moraine to get around some slabs and onto the snow and ice. I saw a single down-boot-pack on the snow, but no tracks from the past couple of days. After mounting the glacier on the left, I crossed to the right on a flat plain of bare ice to avoid the worst of an icefall. It was less broken on the right, but still a bit steep, requiring a mantel and almost causing me to take out my other tool. Above, I crossed back left on another mostly-bare plain, picking up the bootpack again as it dodged a few crevasses on its way up the lefthand side to another plain. Here the tracks faded as they crossed a snowier part of the glacier with some partly-hidden crevasses. I continued with some trepidation, probing at some spots that looked suspicious, but did not have any issues. I was not sure whether to continue up-glacier, or dismount onto a rock rib on its south side, but the boot-pack reappeared in an ascending traverse to the bottom end of the rib, so I did that. I climbed up some mildly annoying rock on the rib, while plotting a route on the face ahead. It looked like the general idea would be to start left, then work right under some seracs before following below the right-hand ridge to the summit. The clouds descended as I climbed the rib, limiting my view of the face, and holding out the prospect of a tricky blind climb. Fortunately, I had seen what I thought were a couple of parties on the face earlier, who proved to be descending after climbing the standard south ridge. They seemed to have found the descent route without any backtracking, so they were either lucky or guides. They seemed a bit skeptical of my plan to traverse the Dom, but did not try to discourage me. I followed the boot-pack as it went right below the serac, then wandered through some other obstacles higher up. At one point it climbed an icy bulge, and I could see where they had dug holes for sitting body-belays. I probably could have done it with one tool, but I had brought the other, so I took it out and got in a few good sticks on this pitch. Higher up, the clouds got thicker and the snow deteriorated, with a breakable crust and sugar covering the underlying ice. This was slow and not always confidence-inspiring, and it seemed to take forever to climb the last few hundred feet to the summit. 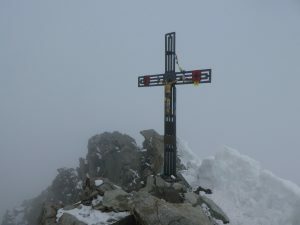 I saw magnificent expanses of light gray in all directions, fresh crampon marks from the groups I had met, and a summit cross with a disturbing Jesus. I suppose I would look like that if I were being crucified, but I am not used to mountain crosses being inhabited, and the version of Jesus I have seen in churches usually looks more sorrowful than agonized. I was tempted to bail, but it wasn’t cold or precipitating, and I could see well enough to avoid cornices and do local route-finding, so I had no real reason not to continue. I oriented myself using the compass on my phone, then started down the kilometer-long ridge to the Dom. The descent to the Domjoch was intricate in places, with slightly less than 500 meters taking me almost an hour. It could have taken much longer, but fortunately there were some sections where I could either traverse on snow to the left, or hand-traverse with my crampons in the snow and hands on the rock. There was fresh snow on both sides of the ridge, mainly on the left, so it made sense to tackle the whole thing in gloves and crampons, occasionally pulling out my ice axe. The crux was an uncomfortable à cheval down a steep knife-edge where I didn’t trust the snow bypass. It began clearing partway down, and I caught glimpses of the Kin Glacier to the west, the rocky east face descending toward Saas Fee, and even, for a few seconds, the summit of the Täschhorn behind me. At the Domjoch, I stuffed a bit of snow in my water bladder, then took off my crampons, figuring that I would gain more time than I would lose climbing the south-facing ridge in just boots. This was the right move: while I lost some time routing around or carefully dealing with the patches of fresh snow, I could move much more quickly along flat or talus-y sections of the ridge. The route generally stayed on or right of the ridge. If I strayed too far right, I ran into fifth class climbing on chossy rock, but staying right on the crest would force me to deal with too many small gendarmes. 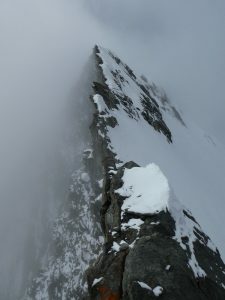 The final obstacle was an ascending ridge through some uber-choss to a notch just southeast of the summit. From there, a steep climb on some slightly less-bad rock and a quick ridge scramble got me to the summit, with its own tortured Jesus and a welcome boot-pack. I finished my food, then got about 50 feet without crampons before deciding that was a bad idea. Mistake corrected, I continued down the well-beaten track, dodging a few crevasses before heading far right to get around what turned out to be a huge serac. 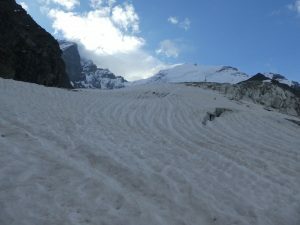 It was partly clearing by now, and hot on the glacier, so the snow was unpleasantly soft on the long walk. Fortunately the big serac was quiet, since it seemed capable of reaching the bootpack. 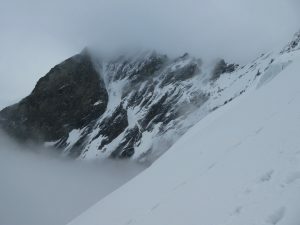 The pack crosses a ridge south at the Festijoch, then descends the choss on the other side to the Festi Glacier, which it follows to its toe above the hut. I finally ran into other people here, one pair slowly downclimbing the choss, and a large group playing around with ropes right in the rockfall zone. I climbed around the pair, then skated past the group, which had organized itself into two rope teams of 4-5 for the long snow-walk. The Dom Hut is much larger and better-used than the Kin Hut, and I saw a few people hanging around outside, and a dozen pairs of boots drying out back. It was still a long walk to the car, all of it on terrain that makes me hate boots. Thinking about it, I realized that to descend comfortably and quickly, I use my ankles a lot, either toe-striking to absorb impact, or angling my foot to land on rocks in particular ways. I cannot do this at all in boots, so I just feel like I am about to damage my knees all the time. I will definitely carry some kind of trail runners next time, even if I start out in boots. The people I met on the way down were mostly uncommunicative, though two members of a Swiss group I met just below the hut gave me dirty looks for no apparent reason. 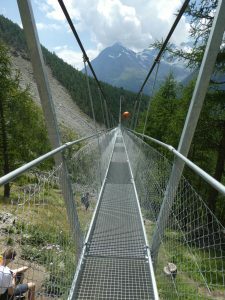 A fair number of tourists go up to the Dom Hut, and many more go up to lower huts, follow the Europaweg trail, or climb up to see the suspension bridge. I had seen signs for it on the way up, and took a slight detour on the way down to cross it. It was a trip, with wrist-thick cables suspending the deck, and hand-rails and fencing on either side to contain the humans. Heavy though it was, it swayed unpredictably under the influence of the people crossing it. I briefly experimented with skipping across, and realized that if I skipped or jumped at the right rate, I could really scare some people. That was the end of fun for the day. The rest was a slog back to the car park, reaching the car around 12h15 after starting. It had taken me 6h50 to summit the Täschhorn, and 1h50-2h for the traverse. I would normally take the next day off after such an outing, but time is money in this part of Switzerland, so I was determined to climb what I intended to climb as quickly as possible.